Tracy K Teal giving the keynote address at the Healthcare Innovation Replicatihon. 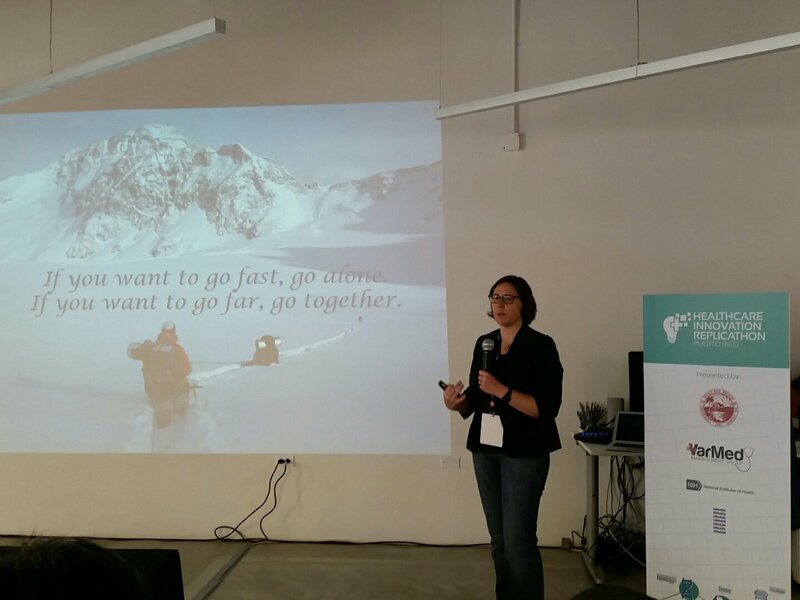 Our Healthcare Innovation Replicathon and Data Carpentry Instructor Training events were a success! Students and faculty from many campuses and departments met on March 24-25, 2017 at the Engine-4 co-working space in Bayamón. 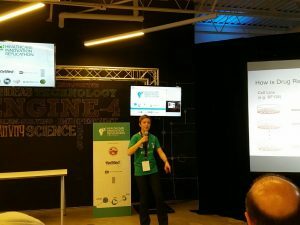 Puerto Rico.. Students took part in the 36-hour Healthcare Innovation Replicathon, led by Alejandro Reyes and Keegan Korthauer from Rafael Irizarry’s rafalab (Dana Farber Cancer Center & Harvard) Patricia Ordoñez (UPR RP Computer Science), and Phillip Brooks from Titus Brown’s Lab for Data Intensive Biology (UC Davis). Students took brief tutorials on R, reproducible research, and statistical analysis, then dove in to examine two studies on pharmacogenomics in cancer cell lines. 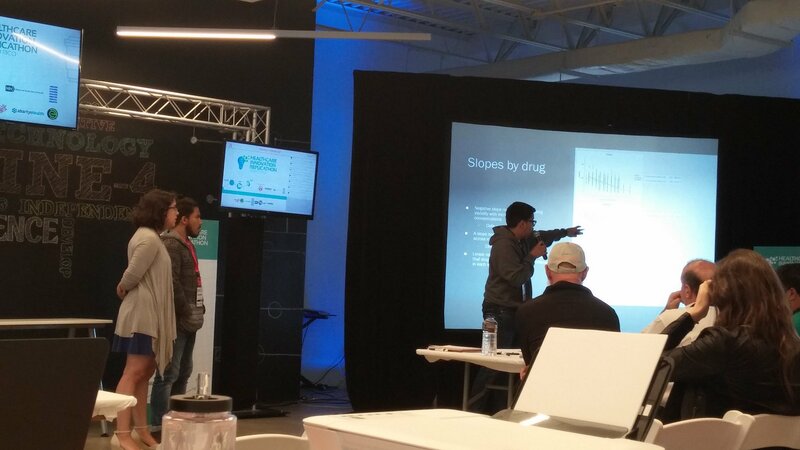 Keegan Korthauer describing the pharmacogenomics problem studied in the Healthcare Innovation Replicathon. Interdisciplinary (and inter-campus) teams of students worked for 24 hours on a re-analysis of data from two large scale studies looking at the effects of 15 drugs in 240 cancer cell lines. They presented their findings on Saturday, including errors in the published figures, their recommendations on improved measures of drug effects, and lists of drugs for follow-up studies. 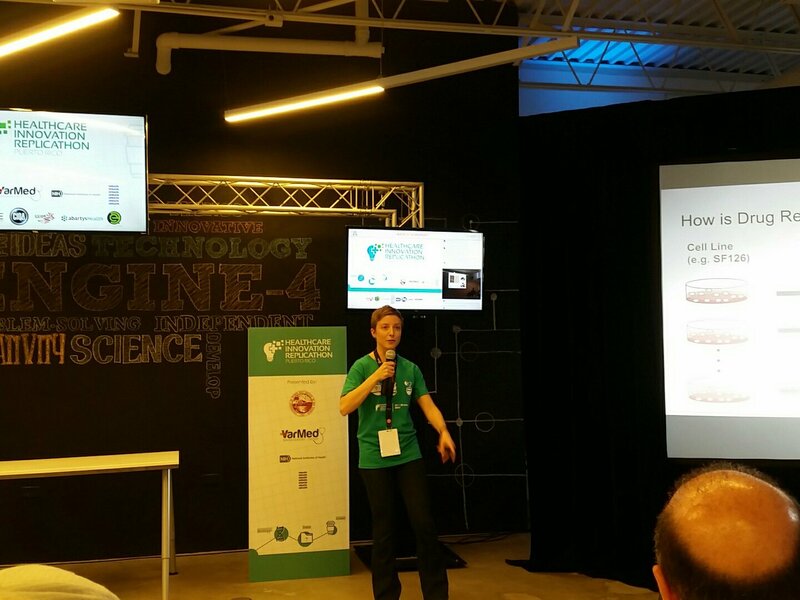 The Healthcare Innovation Replicathon wasn’t just about data, statistics, programs and cancer. 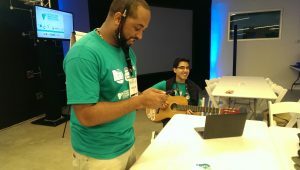 Students, mentors, sponsors, and faculty got a chance to interact in a welcoming environment, with good food, top-notch Internet, and even a guitar or two. Phillip Brooks (standing, tweeting about the event) and Alejandro Reyes (seated, on guitar duty) entertaining the participants in the Healthcare Innovation Replicathon. 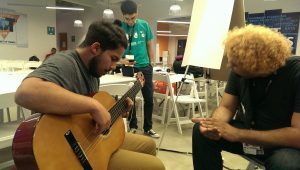 Students from competing teams set aside their differences to make some music. 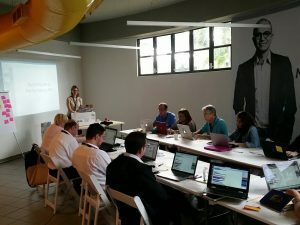 Meanwhile, faculty from Interamerican University Bayamon Campus, UPR Humacao, Mayaguez, Rio Piedras and private industry went through Data Carpentry Instructor Training led by Rayna Harris (UT Austin), Sue McClatchy (The Jackson Laboratory), and Tracy Teal (Data Carpentry). Data Carpentry Instructor Training presents instructors with research-based best practices for teaching data science to novices. Stay tuned for announcements of new Data Carpentry workshops with some of the new instructors soon. A dozen instructors getting trained as part of Data Carpentry Instructor Training. 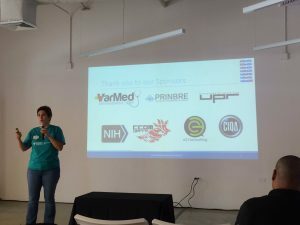 The IDI-BD2K project would like to thank all the sponsors that made this event a success: VarMed Management, PR-INBRE, the National Institutes of Health, CIQA.net, the University of Puerto Rico, the Lab for Data Intensive Biology at the University of California, Davis, rafalab at Harvard University, AbartysHealth, e3 consulting, Data Carpentry, Engine-4, and the UPR Rio Piedras Department of Computer Science. 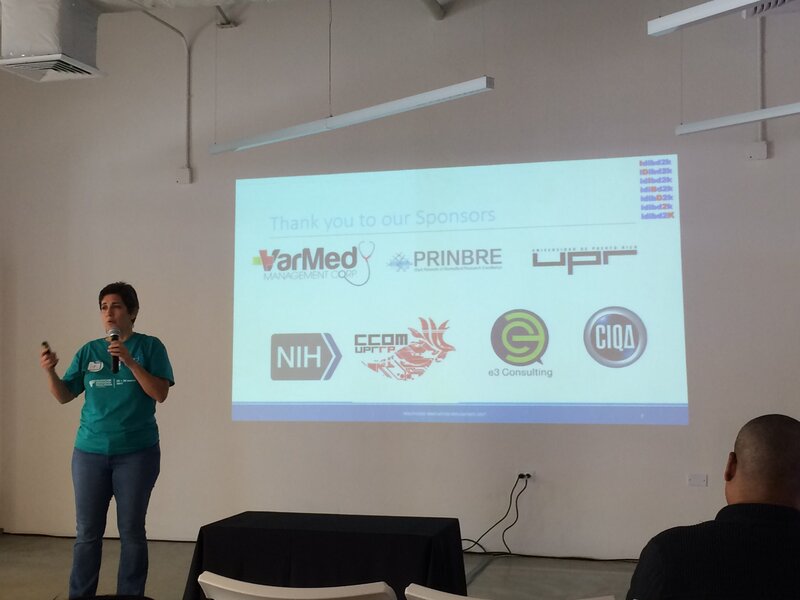 Patricia Ordoñez, one of the IDI-BD2K Principal Investigators, thanking some of our sponsors at the Healthcare Innovation Replicathon.